Are You Dreading the Holidays This Year? Let’s face it, the Holidays are stressful. That's actually why holidays are top of mind for couples in our practice this time of year. Sometimes in-law challenges, gift giving and travel issues can get really heated, especially when there is already stress in the relationship. Whether you’re struggling with financial stress, blended families'holiday sharing and schedules, or just the sheer time needed to host and attend all the gatherings for work and home, it can be so exhausting. But we’d like to help! We’ve put together the following Couples Guide to Holiday Stress Prevention. 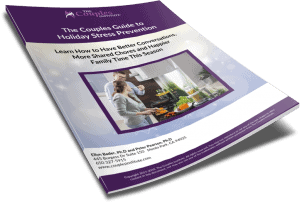 Inside this free guide there are tips, tools, brain hacks, and even sample conversation scripts you can use with your spouse and family during this holiday season. 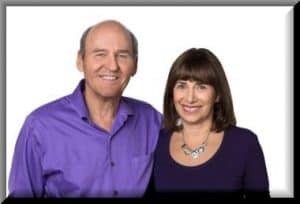 Many of the tips ARE easy and simple, and are the same ones we use and have used with couples in our practice for over 30 years. How doing just this One Thing can help set the tone for the holidays. How to avoid the 2 biggest mistakes couples make negotiating. New conversations you can have with your spouse about the division of labor during the holidays. 3 conversation redirects you can use to avoid fights and enjoy your family and partner more. How to prevent and deflect negative and critical comments from family and in-laws. 5 simple and easy ways to holiday proof your relationship. The Holidays are busy. We understand. That’s why we’ve developed this easy to read guide that can be read and digested in under 10 minutes. We’ve also included a handy, one-page Tips for Holiday Stress Prevention that can be kept in your purse or put on the fridge! Just enter your email below to get access, and start having better conversations and enjoying the holidays more.